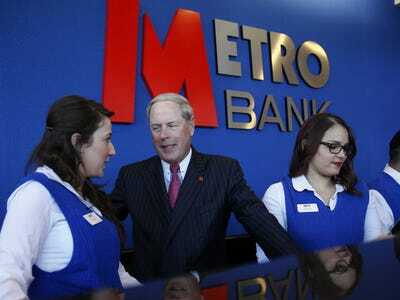 REUTERS/Eddie KeoghChairman Vernon Hill with Metro Bank staff at the Holborn ‘store’, central London. Chairman Vernon Hill is pretty much what you would expect from an American opening a bank in the UK. He’s bullish, straight to the point, and busy. It’s quite hard not to be taken in by the patter and glitz: and clearly I have been. I just signed up for an account. But that’s also a sign of how drab and uncompetitive British banking is. Metro Bank is one of a wave of “challenger banks” sniping at the big UK institutions: these include stand-alone firms like Aldemore and OneSavings Bank, as well as established consumer firms that have dived into banking, like Virgin, Marks & Spencer and Tesco. Our model is based in America and in Britain on service and convenience… This is in a market where the big five banks have run a cartel for years and taken the consumer for granted. I like to say that the major banks here, service is sort of a glaze on top of their business. They also have a philosophy that they’re doing you a favour by letting you bank with them. They have a word for it, they let you apply for an account… We learned to operate on a much more competitive world where if we didn’t provide something different we weren’t gonna be around long. The British banks, I’ve said this may times before, they have or had a cartel going and because of that they could overcharge, under-serve, and they have massively under-invested in their business. All you have to do is walk past any UK bank branch to see what the word “underinvestment” means. But it’s not just a series of gimmicks that’s brought nearly half a million people to the bank, which only set up in the UK in 2010. The bank is open pretty much-year round (362 days), and runs until 8 p.m. on weekday evenings. It doesn’t seem to be competing largely on price: nobody at any point raised the interest rates offered on the accounts (though they are displayed prominently in the branch). It seems like they’re betting that interest rates on most bank accounts are now so low that there’s not very much to differentiate them. We’re more than half commercial here, because as under-served as consumers are, the SME segment up to middle-market size is massively under-served by the UK banks. It’s incredibly difficult for them even to open an account. One of the problems with the British banks are that their IT systems are one step above a quill. They’re way out of date, the banks have admitted it. You can’t deliver service even if you want to if your IT doesn’t give you the information you need. 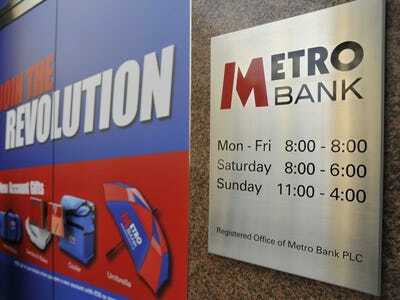 REUTERS/Toby MelvilleThe generous opening hours at Metro Bank are one of its major selling points. That’s one noticeable thing about Metro bank: as is understandable for a new bank, it doesn’t have the legacy IT problems that older institution struggles with. Each desk has a Windows tablet to process new accounts, there’s not a desktop computer in sight. At the rate we’re growing I’m sure we’ll make that (entering the FTSE 100) happen. We’ve announced that our plan is to float in 2016, and we expect to have by 2020 assets over £25 billion ($US). Which should give us a market cap of around £4-5 billion, that is definitely FTSE 100. We should be turning into the black around the time we float, I’m not sure exactly what quarter. While that’s important to us, it’s not as important as growing our business and building our brand. So a few days after talking to Hill, I went back into the store to sign up for an account. I’m happy to be rid of my previous, unnamed bank. What’s most interesting about Metro Bank is that I barely even needed to be convinced. Satisfaction with the big four banks is below 60%, so they’re working with an extremely receptive audience already. 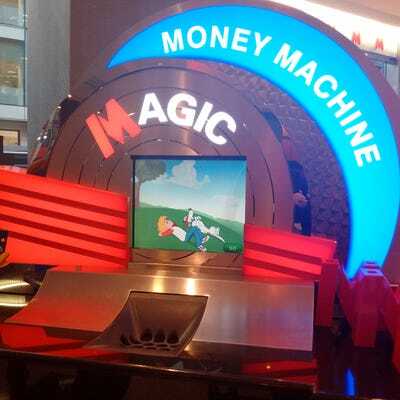 If other people in the UK are anything like me, get used to Metro Bank.